"Cross-border insolvency and shipping companies"
Abstract: This article examines the Hong Kong Court of Appeal’s decision in The Convenience Container, where the court refused to set aside in rem writs even though the shipowner company was in liquidation in a foreign jurisdiction. 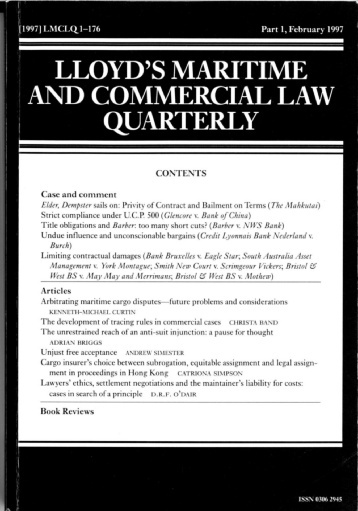 In view of the principle of “modified universalism”, recently endorsed by the English Supreme Court and approved by the Hong Kong Court, the author doubts the correctness of the reasoning in the case and argues that, upon liquidation, the shipowner company ceased to be the beneficial owner of the relevant vessels. Hence, the plaintiffs should not have been allowed to jump the queue of the shipowner’s unsecured creditors by bringing statutory in rem proceedings against the vessel.